President Roosevelt could not have been more right when he began his speech with that famous line 76 years ago. December 7th, 1941 is a date which has lived in infamy for more than three quarters of a century. But, what President Roosevelt probably didn’t consider was how that date would be infamous to different people for different reasons. For Japanese-American citizens and immigrants, and their families, December 7th, 1941 began a long saga of paranoia, discrimination, degradations and hardship. On February 19th, 1942, President Roosevelt signed the, now infamous, Executive Order 9066, which authorized a military commander to determine who could live, enter or remain where within the United States. 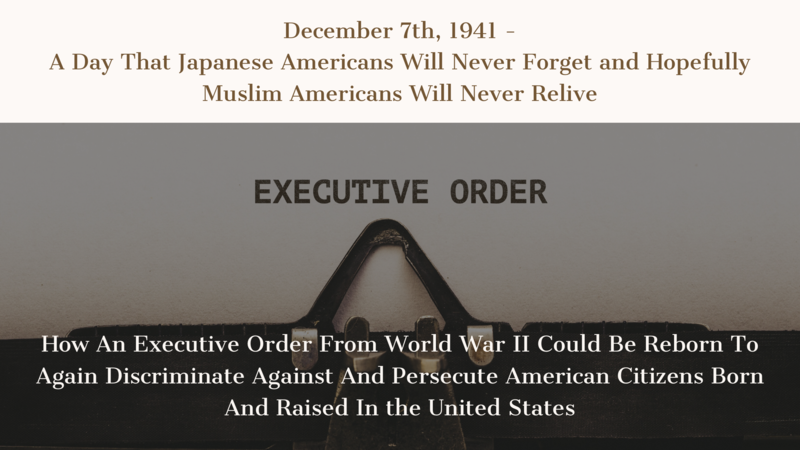 This executive order led to the promulgation of federal regulations that authorized the creation of internment camps and removal of all Japanese-Americans from their homes on the west coast of the United States. An entire population of our country (anyone of Japanese descent) was rounded up from an entire section of our country (the eastern United States) and removed. This executive order applied to United States citizens, born and raised in the United States, who had never stepped foot in Japan and had never stepped foot off of U.S. soil. Loyal Japanese-Americans willing to die for the United States were treated as potential saboteurs and potential traitors, based on nothing but their race. Illogically, the executive order did not apply to Italian-Americans or German-Americans. Many of those who were placed in the internment camps joined the United States military and fought and died bravely for the country they loved. How could this be legal? The United States Supreme Court took the issue up in Hirabayashi v. United States, 320 U.S. 81 (1943). Mr. Hirabayashi was born a full blooded United States citizen in Seattle, Washington in 1918. He had never stepped foot in Japan in his entire life. He went to public school, graduated high school and went to college at the University of Washington, all within his native United States. After Japan bombed Pearl Harbor and after the President’s executive order, Mr. Hirabayashi was stripped from his home and placed in an internment camp. When Mr. Hirabayashi violated a curfew set in place by the military commander, he was charged with two federal crimes of violating the curfew and failure to report to the Civil Control Station as directed by the military commander under the authority of the executive order. 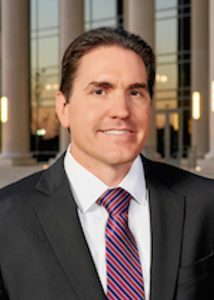 A federal jury found him guilty and he was incarcerated for three months. Mr. Hirabayashi appealed the judgment contending that the curfew violated the Fifth Amendment to the Constitution because it was applied based on race and violated due process. The United States Supreme Court upheld the constitutionality of the curfew and the delegation of power to a military commander to implement it. The Court held that this was a proper war time power. What does this historical decision mean for today’s immigrant? As a result of this decision, for a brief, but painful time in our history, the “land of the free” became more like the land of the Japanese and Nazi powers we were fighting against. Our executive, legislative and judicial branches were all in agreement that it was lawful, just and legal to round up an entire race of people, regardless of their citizenship, loyalty or lack of any criminal or subversive intent. For no other reason, but their racial descent. Although it was a temporary wartime rescission from constitutional protections, the executive, legislative and judicial branches of government worked in conjunction to create a dangerous precedent that can be manipulated today. Many believe that we are at war with a more dangerous foe than Germany, Japan or Italy during World War Two. Terrorism is, no doubt, a serious threat to the safety of all Americans. But just like the thousands of loyal Japanese-Americans during World War II, there are millions of patriotic Muslims in the United States today, many whom are American born and raised. Many of them are in our armed forces putting their lives on the line fighting terrorism. Unfortunately, political rhetoric combined with an increasing anti-immigrant sentiment may create an environment where one of our darkest historic moments repeats itself. It is important that we remember the Japanese-Americans who were subjected to internment, indignities, incarceration, and other ordeals that are completely counter to our American cultural values, so we don’t one day look back and see that history repeated itself with patriotic American Muslim and immigrant populations.